While I was away over the weekend, a box arrived at my home from the WRB - World Robot Boxing league - from Shawn Levy's Real Steel. If you've been following the WRB viral since earlier this year, its been rather slow and off-and-on, but things are finally coming to a close. 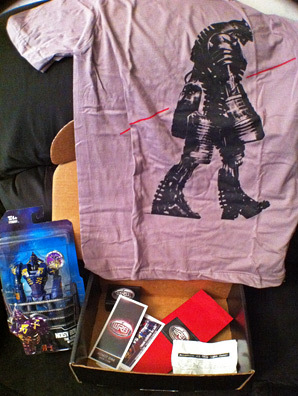 The box contains quite a few pieces of swag, including a badass Noisy Boy t-shirt, a Noisy Boy action figure, a USB drive, two tickets in a red envelope, and a note from the viral underground. I love getting boxes like this completely unexpectedly, and I've heard a few other people have been receiving them including GeekTyrant too. 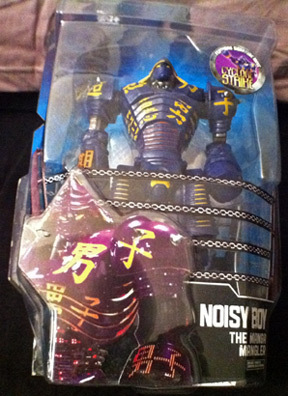 More on what was in the box below! As seen in the photos below, it's just a few pieces of swag, and the USB drive contains a special file that gives you an extra achievement on the WRB.com game. 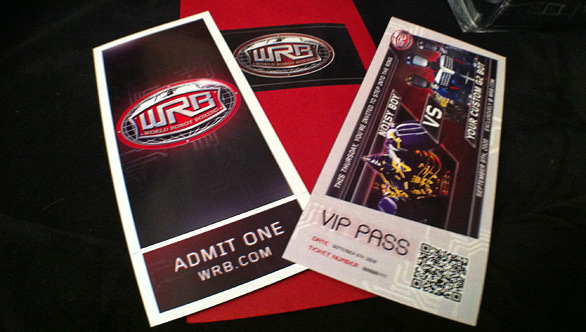 The interesting parts of the kit seem to be the tickets in the envelope - which have a QR code that links to the WRB Facebook, as well as information stating: "This Thursday, you're invited to step into the ring. September 8th, 2020 - Exclusively @ WRB.com", plus "Admit One" on the other side. There's also a note, that I've transcribed below the photos, that's from "The Underworld", which is the underground robot boxing league (that connects directly to the story in the film). The note says: "We heard the WRB was sending you this package, so we thought we'd include a note and make our presence known… but it won't be the last you hear from us. After all, if we can infiltrate a mailer, just think what we can do to their precious website. This Thursday, go to the WRB.com to see a real bot fight." Again, more emphasis to be on that WRB site on Thursday, so obviously something big is going down in a few days. If you've already been there, you know you can create your own fighting robot, a "Custom G2 Bot", which will get to fight in the ring on Thursday. But, of course, The Underground is going to show up, so watch out. I wish they could've had real matches at actual physical locations, but this will be fun to see. That's the only update we have on the WRB viral for Shawn Levy's Real Steel, starring Hugh Jackman, Evangeline Lilly, Anthony Mackie and Dakota Goyo. The DreamWorks produced film hits theaters starting October 7th next month. I've tossed up one of the new billboard banners from The Daily Blam below, it also features purple bot Noisy Boy, but that's because he is the coolest fighting robot out of all of them (right?)! This movie looks like every generic boxing movie ever, but with robots. If it's successful at the box office, I fear we will see clones of this movie with every other sport imaginable. I've been trying to remember who "Atom" was fighting in the Cobo hall scene. ?